But the best thing about "Meet the Robinsons" is its story, which turns those adoption myths (that kids "audition" for adoptive parents, that the key to happiness is finding your biological origins) on their head and happens to have an important moral: No matter how victimized, put upon, picked on or just plain unlucky you are -- how most delicately to put this? -- get over yourself. This lesson is delightfully delivered by the film's fabulous villain, a spiky, improbably balletic creature named Bowler Hat Guy (voiced by Anderson himself). By far the most memorable character in a film that at times seems to feature a cast of thousands, Bowler Hat Guy provides most of the film's comedy as well as its hard-won pathos. Based loosely on a very loved book from my childhood, A Day With Wilbur Robinson. Created by William Joyce, also the creative force behind Disney Channel's Rolie Polie Olie. Someone in a recent thread about Treasure Planet called Meet the Robinsons an " embarrassingly bad 3D [movie]". I had to beg to differ. The animation is *perfect* for the Joyce environment, and the movie is just so full of heart. There are a couple of jokes that fall flat, of course, but it's a generally funny, smart romp. I agree, the animation in Meet the Robinsons is totally fine, and works well with their specular depiction of the future. This movie is also associated with my favorite Disney park-associated song, and is far superior to the other Tommorowland-associated movie. I'd give it a B+, but it's one of the weirdest, most confusing B+'s ever. It's A for one sequence, C for the next, and then it bumps along as a B for a while before crashing hard into a D.
As I understand it, this is what happened: Disney was almost finished making a pretty crappy movie. Then they merged with Pixar and John Lasseter saw what they were doing and ordered them to make huge changes, including a scarier villain with a weird, flying hat robot sidekick, and a big chase scene with a t-rex. (And of course, the villain, the hat robot and the t-rex chase all seem very Pixar and they're far and away the best part of the film.) By some accounts they re-did about 60 percent of the movie. It wouldn't surprise me if they did, because the film's roughly 60 percent good and 40 percent unwatchable. 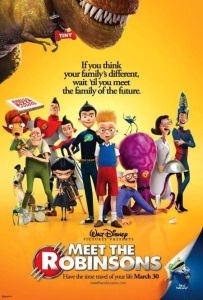 The big problem with the movie (and it's a big problem) is the Robinsons themselves. They're supposed to be crazy in a funny way but they come across like people in a mental ward. One guy is "married" to a lady glove puppet on his hand; another wears his clothes backwards (insisting that his clothes are on the right way but his head is backwards); another is a hugely obese, unspeaking, man-child idiot who throws tantrums if he doesn't get his peanut butter and jelly. Seriously, the scenes with this gang play less like a trip into the future and more like an enforced stay in the Cuckoo's Nest. Almost every moment that they're onscreen is frenetic, noisy and confusing - except for when they suddenly turn maudlin, like when they offer to adopt Lewis after having known him for 10 minutes or so. All that being said, there's a lot to like about the film. The villain has an interesting backstory and there are a lot of funny sight gags involving his flying hat robot. Some of the stuff about adoption is genuinely affecting. It's a good movie - except when it isn't. Which is often. This movie packed an emotional punch I was not expecting at all.